Tapioca refers to the starch extracted from cassava root which is rich in vitamin B-complex, comprising folate, pantothenic acid, and B6, as well as iron, calcium, manganese, copper, and selenium. Topioca is extracted from the processing of the root treatment of cassava plants and is further processed into various forms such as flakes, powder ball-shaped pearls or sticks. Globally increasing awareness about health benefits of tapioca extracts and increasing health conscious people is expected to remain key growth driver during the period of study. This report identifies the Tapioca ingredients/extracts market size in for the year 2015-2017, and forecast of the same for year 2022. 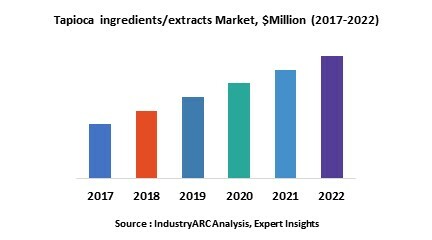 It also highlights the potential growth opportunities in the coming years, while also reviewing the market drivers, restraints, growth indicators, challenges, market dynamics, competitive landscape, and other key aspects with respect to Tapioca ingredients/extracts market. Geographically North America dominated Tapioca ingredients/extracts market owing to higher demand and consumption of convenience food products as a result of fast life cycle of the people in the nation. North America was followed by Europe and Asia-Pacific as the second and third largest market for tapioca ingredients/extracts in 2015. However, Asia-Pacific is expected to remain fastest growing regional market driven changing lifestyle of the people, increased applications of tapioca ingredients/extracts in the food & beverages industry in the major economies such as India, China, thereby leading to the high growth in Asia Pacific during the forecast period.